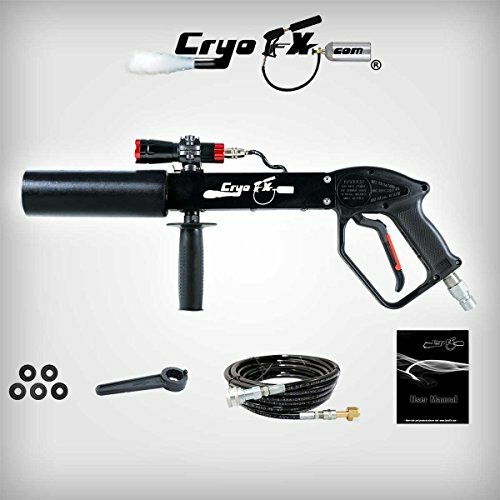 Industries most sought after and trusted Cryo Gun, designed by a company who specializes in Co2 Effects Products... CryoFX! Used by headline DJs, Movie FX Professionals, Celebrities, & World Renouned Nightclubs & Events. Includes 25' feet of CryoFX Signature Brand High Pressure Hose, Fittings, CO2 Fitting & Operation Manual. Plug and Play ready, no electricity or intricate assembly needed. Ready to use within minutes! Includes light to light up Co2! View More In Snow Machines. If you have any questions about this product by CryoFX, contact us by completing and submitting the form below. If you are looking for a specif part number, please include it with your message.